1 Who is Jesus Christ? “Who is this ancient figure who stands at the crossroads of history? Is He a great teacher? A revolutionary? Prophet? Or is He, indeed, the divine Son of a divine Father, the literal Savior of the world? . . . He has been called a peasant, a mystic, a charismatic leader, a wise teacher, an influential social critic. His words have been pored over, adapted, and translated into nearly every language. Tales of his many miracles have been celebrated by even the obscurest of cultures. Introduction to Messiah: "Behold the Lamb of God." In 1842, George Barstow was writing a history of New Hampshire and wanted to include a chapter about members of The Church of Jesus Christ of Latter-day Saints living there. At that time the Church was headquartered in Nauvoo, Illinois. Barstow asked John Wentworth, a Chicago newspaper editor, to contact Joseph Smith, Prophet and President of the Church and ask him about the beliefs of the Church. Joseph responded with what has become known as the “Wentworth Letter.” Written to people not of the LDS faith, the last part of the letter contained 12 succinct basic beliefs of the Church—the Articles of Faith. The first of these Articles states, “We believe in God, the Eternal Father, and in His Son, Jesus Christ, and in the Holy Ghost.” In other words, Mormons believe that God the Father, His Son, Jesus Christ, and the Holy Ghost are three separate personages. As Jeffrey R. Holland, a member of the Quorum of the Twelve Apostles powerfully testifies, “Jesus Christ is the literal, living Son of our literal, living God. This Jesus is our Savior and Redeemer who, under the guidance of the Father, was the Creator of heaven and earth and all things that in them are. I bear witness that He was born of a virgin mother, that in His lifetime He performed mighty miracles observed by legions of His disciples and by His enemies as well. I testify that He had power over death because He was divine but that He willingly subjected Himself to death for our sake because for a period of time He was also mortal. I declare that in His willing submission to death He took upon Himself the sins of the world, paying an infinite price for every sorrow and sickness, every heartache and unhappiness from Adam to the end of the world. In doing so He conquered both the grave physically and hell spiritually and set the human family free. I bear witness that He was literally resurrected from the tomb and, after ascending to His Father to complete the process of that Resurrection, He appeared, repeatedly, to hundreds of disciples in the Old World and in the New. I know He is the Holy One of Israel, the Messiah who will one day come again in final glory, to reign on earth as Lord of lords and King of kings. I know that there is no other name given under heaven whereby a man can be saved and that only by relying wholly upon His merits, mercy, and everlasting grace can we gain eternal life.”full text here. John’s Gospel begins, “In the beginning was the Word, and the Word was with God, and the Word was God. The same was in the beginning with God. All things were made by him; and without him was not any thing made that was made” (John 1:1–3). “Word” here is a translation of the Greek logos and in this context accepted as referring to Christ. Joseph Smith made an inspired translation of parts of the Old and New Testament, found in the LDS scripture Pearl of Great Price. In that book we find a conversations between God and Moses and God and Abraham, where Jesus Christ is revealed as the Creator of the earth upon which we live, a separate being sent by His Father, “And there stood one among them that was like unto God, and he said unto those who were with him: We will go down, for there is space there, and we will take of these materials, and we will make an earth whereon these may dwell. . . . And the Lord said: Whom shall I send? And one answered like unto the Son of Man: Here am I, send me.” (Abraham 3:24, 27); “And worlds without number have I created; and I also created them for mine own purpose; and by the Son I created them, which is mine Only Begotten. . . . But, behold, my Beloved Son, which was my Beloved and Chosen from the beginning, said unto me—Father, thy will be done, and the glory be thine forever.” (Moses 1:33; 4:2). Mormon beliefs about Christ’s sojourn on earth are founded in the New Testament and in the ancient record known as the Book of Mormon, which was given to Joseph Smith and translated by him through divine inspiration. Additional insights and interpretations are found in the Doctrine and Covenants, a compilation of revelations given through and to the Prophet Joseph Smith during his lifetime and to subsequent prophets of the Church. In a world where increasingly the divinity of Jesus Christ is being questioned, Mormons strongly and confidently affirm that Jesus Christ is the Son of God. That He came to this earth as a child, born of Mary. 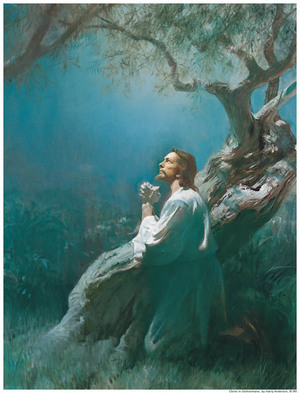 Through His Atonement, achieved both in the Garden of Gethsemane and on the Cross, He suffered the sins of the world, so that everyone who is born on this earth may have the chance to repent of the inevitable sins and transgressions they commit during their lifetime, be resurrected after they die, and gain eternal life. How the Atonement is able to temper justice with mercy is explained by the Book of Mormon prophet, Alma, “The plan of mercy could not be brought about except an atonement should be made; therefore God himself atoneth for the sins of the world, to bring about the plan of mercy, to appease the demands of justice, that God might be a perfect, just God, and a merciful God also” (Alma 42:15). As recorded in the New Testament, Mormons believe that Christ was crucified on Calvary, buried in the Joseph of Arimathaea’s tomb and that when the Sabbath was over, He rose from the dead, and for forty days appeared to and taught His disciples and others (see Matthew 28; Mark 16; Luke 24; John 20–21; Acts 1). Sometime after He ascended into heaven, to His Father, Mormons believe that Christ appeared to the people of the Americas, as recorded in the Book of Mormon. There He taught the descendants of Lehi, the Book of Mormon prophet who led his people from Jerusalem to the Americas in 600 BC. Christ’s teachings paralleled and expanded on those given to the Jews. He bore testimony of His own mission, “I came into the world to do the will of my Father, because my Father sent me. And my Father sent me that I might be lifted up upon the cross; and after that I had been lifted up upon the cross, that I might draw all men unto me, that as I have been lifted up by men even so should men be lifted up by the Father, to stand before me, to be judged of their works, whether they be good or whether they be evil—And for this cause have I been lifted up; therefore, according to the power of the Father I will draw all men unto me, that they may be judged according to their works. And it shall come to pass, that whoso repenteth and is baptized in my name shall be filled; and if he endureth to the end, behold, him will I hold guiltless before my Father at that day when I shall stand to judge the world” (3 Nephi 27:13–16). 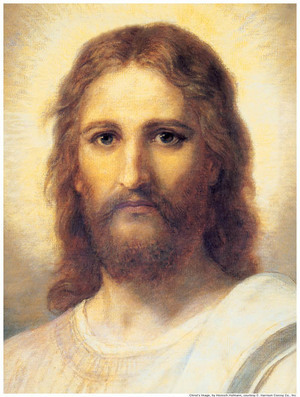 Members of The Church of Jesus Christ of Latter-day Saints believe that Jesus Christ is the head of the Church and that through His living Prophet, He leads and guides and directs the Church. Mormons believe in direct and ongoing revelation, that through the Holy Spirit, every man, woman, and child can receive inspiration from the Savior for their own individual lives and for those over whom they have stewardship. Mormons pray to their Heavenly Father through Jesus Christ. As Joseph Smith himself testified, “And now, after the many testimonies which have been given of him, this is the testimony, last of all, which we give of him: That he lives! For we saw him, even on the right hand of God; and we heard the voice bearing record that he is the Only Begotten of the Father—That by him, and through him, and of him, the worlds are and were created, and the inhabitants thereof are begotten sons and daughters unto God” (Doctrine and Covenants 76:22–24). This page was last edited on 21 February 2012, at 12:01.